One of the greatest Baroque masters in the northern Italian port city of Genoa, Castiglione trained in his hometown under minor animal and landscape painters. His distinctive personal style is characterized by energized, lively handling of the brush, drawing stylus, and etching needle. Oil sketches by the Flemish painters Anthony van Dyck and Peter Paul Rubens may have inspired his loosely executed paintings and helped him develop the spirited manner that he maintained throughout his career. 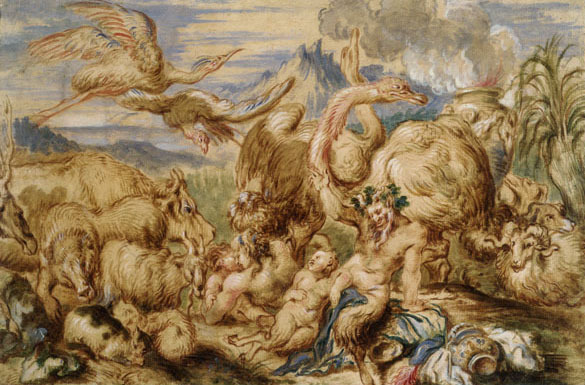 Of Castiglione's many paintings and prints representing zoolike arrays of animals, both real and mythological, several oil sketches like this one survive today. Using as a pretext for the gathering the loading of Noah's Ark, the artist based his image on classical mythology rather than the biblical world.